I'm back today hosting Mom's Library along with True Aim. Mom's library is my favorite "new-to-me" linky party. I love it because there are so many awesome ideas and tons of variety. If you are a mom of preschool through elementary aged kids, this is really one-stop shopping. You can find book reviews, activities for kids, crafts, devotionals, tips for moms, recipes, etc. Last week I really enjoyed reading some of the Dr. Seuss themed posts. It was a great time for bloggers to link up Seuss activities as Read Across America Day and Dr. Seuss's birthdays are this weekend! 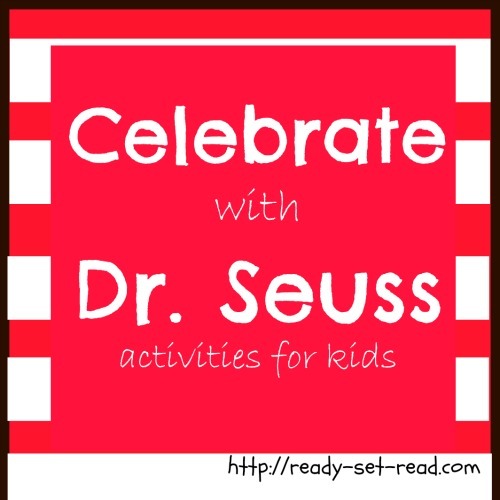 In honor of Mr. Geisel's birthday-- I think he would be 109 -- here are a few of my favorite Seuss themed activities from the Mom's Library Link up last week. 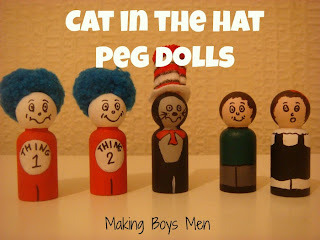 Cat in the Hat Peg Dolls from Making Boys Men- Complete tutorial for making these Cat in the Hat Peg Dolls that would be perfect for story telling or play time. 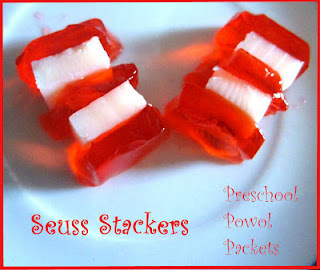 Learning Fun for Dr. Seuss's Birthday- Preschool Powol Packets Several fun ideas for celebrating Dr. Seuss's birthday including directions for these cute "Seuss Stackers". 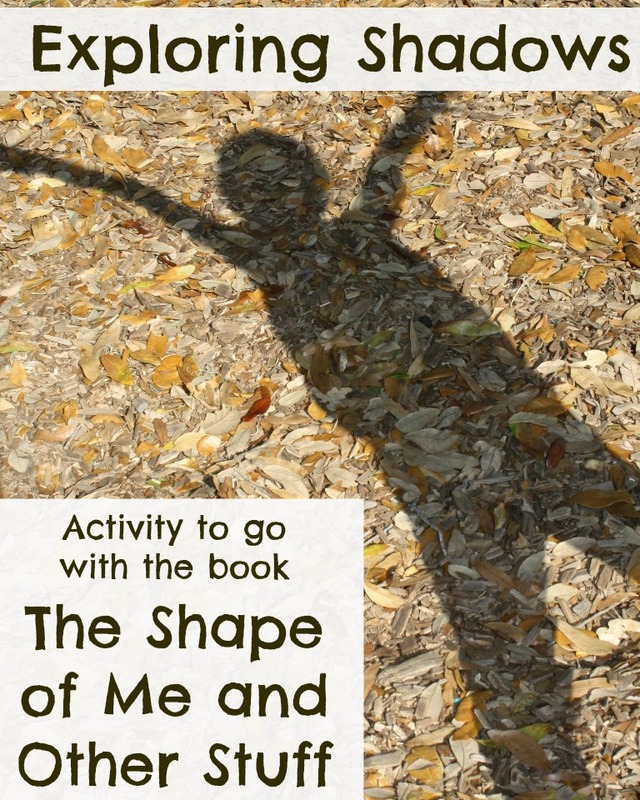 The Shape of Me and Other Stuff - Fantastic fun and learning- great activity to accompany the book, "The Shape of Me and Other Stuff". This is a wonderful activity for home but I also love the extension for making a class book from this activity. If you love the book, Green Eggs and Ham, you have to check out these activities. There is a movement activity, a drawing activity, a word family and word matching activity, and of course... a cooking activity! 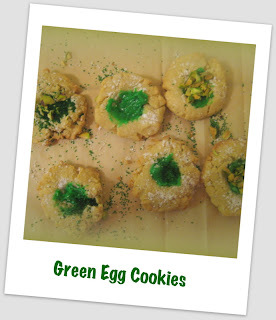 These Green Egg cookies look adorable! If you didn't grab my Wacky Wednesday Freebie! 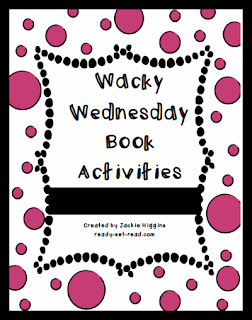 Here are some fun activities you can use to make your Wednesday Wacky. You can also find Dr. Seuss activities on my Dr. Seuss Activities Pinterest board. I've pinned several of them from the Virtual Book Club for Kids which is featuring Dr. Seuss as the featured author this month. Thanks so much for featuring our shadow activity! I hope others enjoy it, too. Hi Jackie! Thanks for hosting and including me in your features! Have a great weekend! Those green eggs and ham cookies look just like something my DD would like to make - you've given me a good idea for this weekend! Love your picks for this week! Thanks for hosting! I linked to this in my newsletter yesterday, it is wonderful. Where did your Easter Lily post go? Thanks so much for featuring us -- and for being part of this great linky.